New to StudioPress? Get the Genesis Framework & 35+ StudioPress Theme Packages free with a WP Engine plan. Essence Pro is a beautiful, clutter-free theme for sites in the health, wellness, and lifestyle niches. Niche is a Genesis-powered WordPress Theme for bloggers that wanna go pro. Academy Pro is the theme for online course creators, membership site owners, and educational content marketers. The Perfect Theme for Wellness, Food/Recipe, Fitness and Lifestyle Sites. Want a website that’s substantial but simple? Come see the sleek difference that white space and typography make in minimal design with Monochrome Pro. Business Pro is designed to be simple yet flexible. It leverages the built-in core functionality of WordPress like custom logos, custom header videos and images, the new image and video widgets, featured images, and more. Corporate Pro is a smart investment for businesses wanting to make a lasting impression. Gallery Pro is a posh yet minimalist theme. It offers a warm welcome that is streamlined and full of light. If you’re a digital business looking to elevate your brand, Infinity Pro was made for you. It’s an elegant, responsive way to introduce your online presence. If you are a creative agency looking to showcase your portfolio to potential clients, Studio Pro is the perfect solution. Kreativ Pro is a multi-purpose theme designed for agencies to showcase projects in style. With great typography and clean layouts, Kreativ Pro is the best theme for your Agency website. If you are an entrepreneur and ready to build a timeless, classic brand, Refined Pro is the perfect foundation for your business. Daily Dish is a brand new theme for Genesis that is designed to present your content like it's the most appetizing dish at your favorite 4-star restaurant. Do you focus on mindful living? Your attention to health and well-being can now extend to your website. The parallax effects will grab your eye, but it's the features and flexibility that will move your mind. Slush Pro was made to capture attention and turn that attention into sales. Its beautiful marriage of marketing and marketplace helps craft a comfortable space online to share your thoughts and feature your work. Pat Flynn knows it takes three key elements to create a successful online platform: design, content, and strategy. Ready for the perfect blend of minimalism and responsiveness in a food-focused theme? We’re pleased to introduce Cook’d Pro. 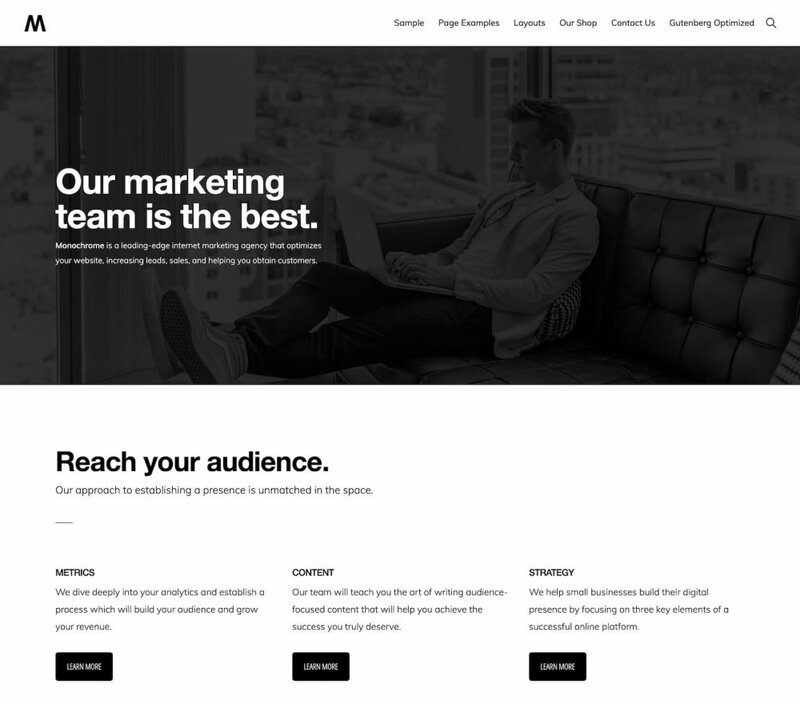 This “posh yet minimalist” theme offers a warm welcome that is streamlined and full of light, and it was designed to take your business to the next level and help you connect with your ideal audience. Flashbulbs go off and you realize that once again, your business has attracted the attention of adoring crowds. Put your name and your message at the forefront with Hello! Pro, the theme that establishes your unique personal brand. Building an e-commerce site? Jessica is here to help. If you’re looking for refinement and a polished presentation, your search is over. Elegance is a graceful theme for smart, sophisticated businesses. When you’re ready to step it up and seize success with a bold, eye-catching theme, you’re ready for Aspire Pro. You put a lot of thought and care into the spaces you style ... why should your digital presence be any different? Your unmistakable style deserves a site that features it beautifully. Are you launching a startup business? Or do you want your business to look like a startup? Meet Kickstart Pro. Revolution Pro is a minimal design that provides the perfect canvas to showcase your finely crafted content. The white space allows your content to breathe, and the use of Playfair Display puts a spotlight on headlines and blockquotes. This theme is integrated with HubSpot and leverages the One-Click Theme Setup so you can get up and running faster with your website and HubSpot's marketing tools.